I have previously reviewed Mimi Cheng’s but I was walking past this spot recently and their February Special Dumpling caught my eye. 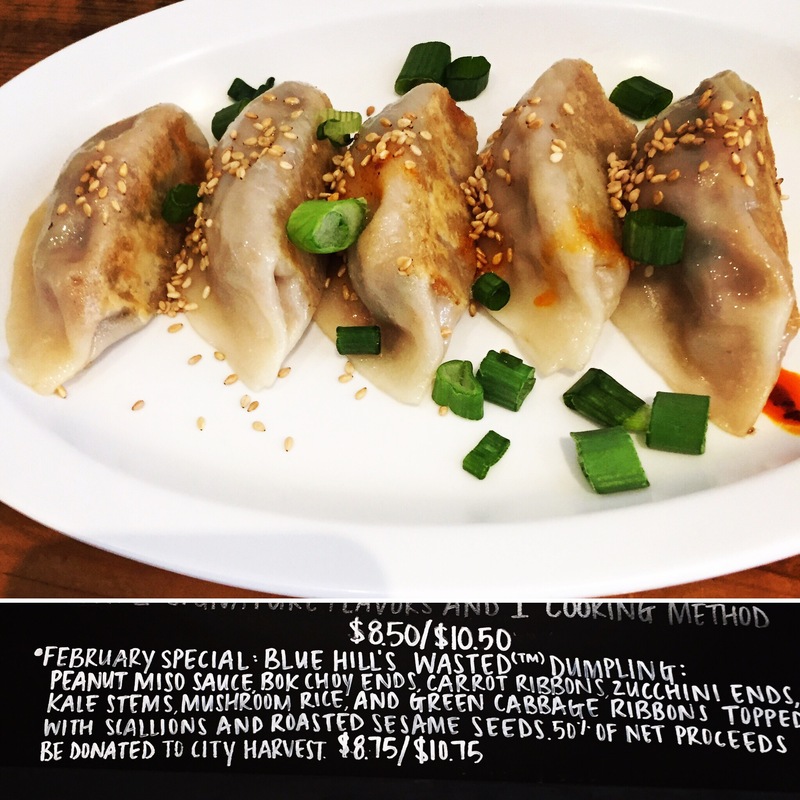 This month’s Dumpling Special was inspired by wastED and was developed in collaboration with Blue Hill. The dumplings are stuffed with ingredients that typically get composted during the prep process for Mimi Cheng’s other dumplings. So the filling for the February Special Dumpling is bok choy ends, carrot ribbons, zucchini ends, kale stems, rice cooked in mushroom juice, and green cabbage outer leaves, with peanut miso sauce mixed in. Half of the net proceeds from the February Special Dumpling will be donated to City Harvest, which feeds almost 1.4 million New Yorkers by rescuing food waste. These dumplings were really excellent and I hope to squeeze another visit to Mimi Cheng’s in before February ends. The rice in the filling gave the dumplings a really nice chewy mouth feel and the miso sauce provided a rich nutty, smokey, umami flavor. However the veggies were still an integral part of the flavor mix, highlighting wastED’s mission to show that discarded, ignored or un-coveted ingredients can make an awesome dish. The dumplings come plated with toasted sesame seeds and slivered scallions. The wastED inspired dumplings are only available in February so run down to Mimi Cheng’s and get them while they last. This entry was posted in New York City, Vegan, Vegetarian. Bookmark the permalink.